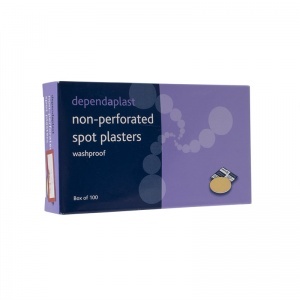 An extensive selection of waterproof and ventilated plasters, the Dependaplast Washproof Non-Perforated Spot Plasters (Pack of 100) are a necessary provision that should be kept in every medical facility, home, workplace and sports first aid kit. The membrane of the flexible polyurethane plastic is moisture vapour permeable, allowing the skin to breathe without the need for perforations. The adhesive material of the Dependaplast Washproof Spot Plasters is low allergy and latex-free, and so is ideal to use on sensitive skin without compromising on its exceptional sticking properties. The spot plaster is 2.2cm in size, and is designed for smaller areas of injury that you wish to keep protected, which makes them ideal to use after injections or procedures involving needles. The zinc oxide adhesive ensures that the plasters will secure firmly in place once fixed on the skin, however is also able to easily come off without causing harm or leaving any unsightly plaster markings. The wound pad is comprised of two parts: a protective contact layer to cushion the wound, and a high absorbency lint pad underneath to soak up any excess exude. The ventilated materials of the plasters allows the skin to breathe without the need for physical perforations, keeping the adhesive securely in place while acting as a barrier to water, virus and bacteria. 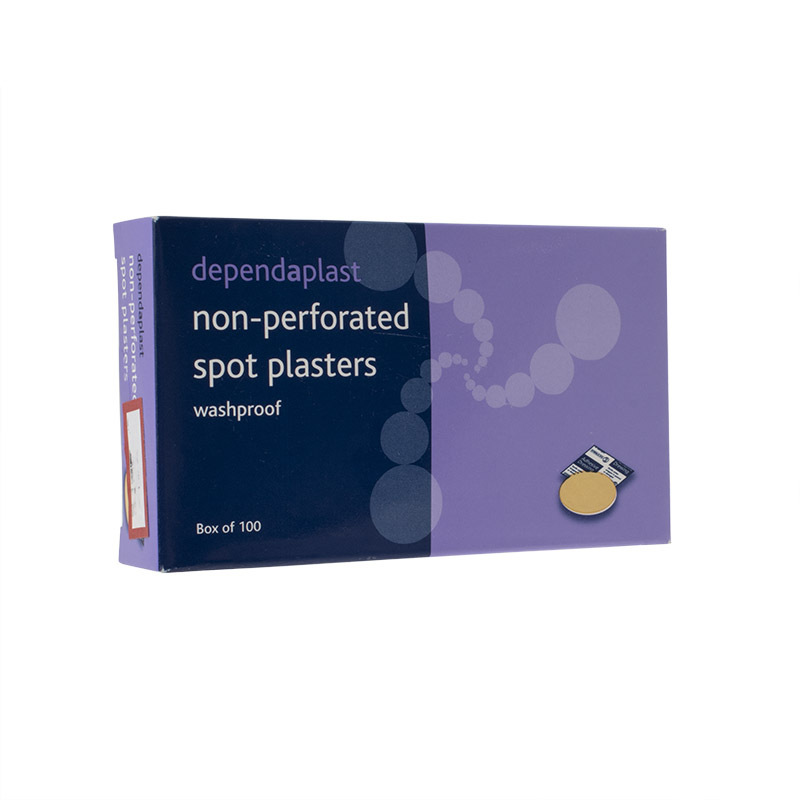 The Dependaplast Washproof Non-Perforated Spot Plasters (Pack of 100) are usually dispatched via First Class Royal Mail and delivery should be within 1 to 3 working days.